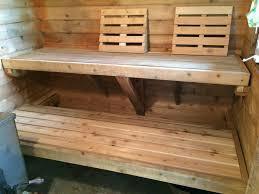 Sometimes you may be aware that your sauna has seen better days, perhaps its been installed for a long time and the internal timber has been damaged by the constant heat, or maybe if the sauna has been exposed to swimming pool water (heavy in Chlorine) its showing signs of premature rotting. Timber which has been exposed to severe heat for a long time may become very dry and areas around the heater in particular may become so badly damaged that they become a fire hazard. You don’t ALWAYS have to rip the whole thing out and start again, we can often breath new life back into your sauna by providing a complete internal refurbishment. We can re-line the walls and ceiling with new tongue & groove boards, install new bench seats and infill panels, even add new LED lighting and a new heater if required. 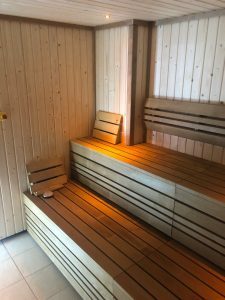 You will see from the images below that its impossible to tell the difference from a new sauna to the old one, and often at a fraction of the cost of a completely new sauna. Why not ask for a quotation ? 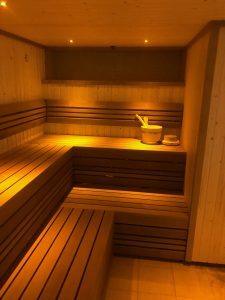 Sauna with newly refurbished internal walls/ceiling and bench seating and new LED lights. Aspen walls and Alder bench seating/backrests for this refurbishment.